If not for the sympathy, kindness and generosity of Joseph G. Eastland (1831–1895), Norton I probably would have been destined for a pauper's funeral and a pauper's burial. Eastland was a co-founder and officer of the San Francisco Gas Lighting Company — which, over the course of several mergers and acquisitions, became the modern-day PG&E. He also was a charter member of Occidental Lodge No. 22 of the Free and Accepted Masons — the same lodge that had counted Joshua Norton a member before suspending him for non-payment of dues. Almost certainly, Eastland was among those Masonic brothers who, from time to time, chipped in to help ensure that Emperor Norton's rent was paid and that he did not go hungry. When Emperor Norton died in January 1880, it was the prosperous Eastland who donated his extra plot in San Francisco's Masonic Cemetery for the Emperor's burial. And it was Eastland — then the president of the prestigious Pacific Club — who circulated among his fellow Club members a prospectus urging them to help bear the cost of the silver-trimmed rosewood casket that bore the Emperor to his rest. Eastland set the pace. Others followed his lead. Fast forward to 1934. San Francisco was well into the years-long cemetery eviction that would require Emperor Norton's remains to be moved from the old Masonic Cemetery to Woodlawn — the new Masonic cemetery, in nearby Colma, Calif.
Would members of the Pacific Club once again step up to ensure that the Emperor had a proper resting place? In 1889, the once-separate Pacific and Union Clubs had merged to form the Pacific-Union Club, whose impressive brownstone digs preside over Nob Hill alongside Grace Cathedral and the Hill's two grand hotels: the Fairmont and the Mark Hopkins. It was members of the Pacific-Union Club who in 1934 convened themselves as the ad hoc Emperor Norton Memorial Association, for a similar purpose as Joseph Eastland and his Pacific Club friends had done 54 years earlier: to secure a plot for Emperor Norton in Woodlawn and to raise money for a proper headstone, which — history is murky on this — may never have been provided the first time around. This single leaf tucked inconspicuously into the Emperor Norton ephemera collection of the California Historical Society — an undated "Statement of Receipts and Disbursements" on Emperor Norton Memorial Association letterhead — bears witness to how much was raised for the "Emperor Norton Fund"; who gave what; and how the money was spent. Statement of receipts and disbursements for account of Emperor Norton Fund of the Emperor Norton Memorial Association. California Biography Collection, Norton, Joshua A. (Emperor), California Historical Society, BIO-COLL_0001. In addition to the boldfaced names on the contributors' list — two Crockers and Timothy Hopkins, the adopted son of Mark Hopkins's widow — there are a few other notables. Ernest Wiltsee, the Association's "Eastland," was first vice-president of the California Historical Society. George Barron, the Association's vice-president, was the longtime curator of the de Young Museum. Edwin Grabhorn was the co-founder, with his brother, Robert, of the Grabhorn Press, the storied fine printer. Allen Chickering was president of the California Historical Society. And there was a separate contribution from Pacific-Union Club itself. It's remarkable to contemplate that the entire endeavor — from burial plot to dedication ceremony — cost $315.55, and that the rose granite headstone that has presided over the Emperor's grave for nearly 84 years now cost only $74.70 in 1934. The stone was created by L. Bocci & Sons, which was founded in Colma in 1896. The Bocci family closed the company in 2005 but sold it in 2009 to a group of Russian immigrant workers who reopened the firm and kept the name — making Bocci & Sons one of only two of Colma's early generation of monument makers that are still in business today. The other is V. Fontana & Co., founded in 1921. Approaching Woodlawn from the north on El Camino Real, L. Bocci & Sons is on the right, just before the overpass — with the cemetery on the other side. The next time you make the pilgrimage to visit Emperor Norton's grave, give a little salute as you pass by the Bocci works. Like everyone who makes this pilgrimage, you'll be breathing a little more new life into the Emperor's story. L. Bocci & Sons did, too — in 1934. 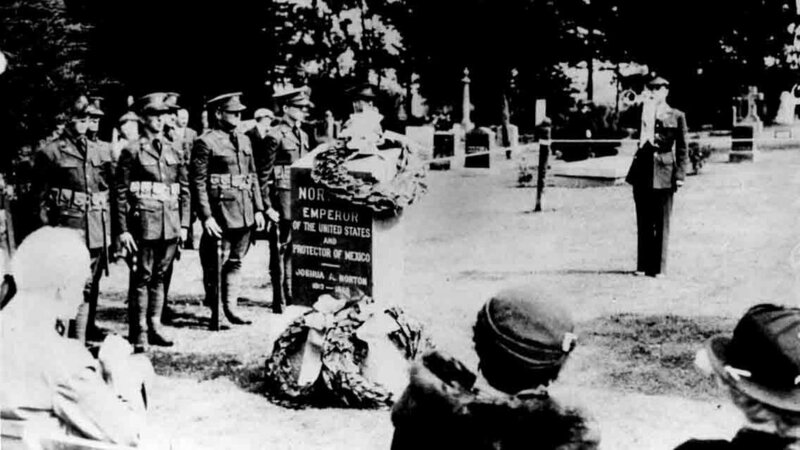 Dedication ceremony for reburial of Emperor Norton, with new headstone, in Woodlawn cemetery, Colma, Calif., 30 June 1934. Source: Jewish Museum of the American West.